GEMS 2.0 is a follow-up of the GEMS – Graph Exploration and Manipulation on interactive Surfaces project, which was carried out from November 2012 until February 2016. Similar to its predecessor, GEMS 2.0 is a cooperation between the Interactive Media Lab Dresden at the Technische Universität Dresden and the Chair of Computer Graphics (VC²G) at the University of Rostock. Graphs are universally relevant in many application domains, such as communication, transportation, biology, and climatology. In these domains, there is an increasing demand for methods and tools that do not only support working with a graph’s structure, that is, its nodes and edges, but also with numerous data attributes that may be associated with the graph. Understanding such multivariate graphs comprehensively is a significant challenge for the people working with them. Working with data usually means analyzing them. 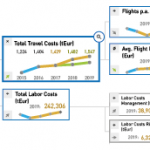 Interactive visual analysis has proved to be an effective mean to gain insight into data. Yet, there is more to working with graphs than understanding basic information of their structure and attributes. In this proposal, we plan to study how classic exploratory graph analysis can be advanced to include comparative analysis of multiple graphs and the possibility to directly edit a graph’s nodes and edges as well as its associated attributes when necessary. 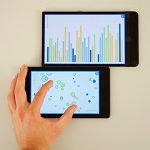 Vistribute: Distributing Interactive Visualizations in Dynamic Multi-Device Setups. To appear in Proceedings of the ACM Conference on Human Factors in Computing Systems.CHI '19, Glasgow, Scotland, UK.ACM,2019.10.1145/3290605.3300846Links: Video Preview, Github. 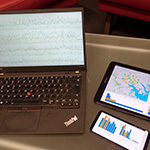 Designing for Visual Data Exploration in Multi-Device Environments. When David Meets Goliath: Combining Smartwatches with a Large Vertical Display for Visual Data Exploration. In Proceedings of the ACM Conference on Human Factors in Computing Systems.CHI '18, Montreal, QC, Canada.ACM,2018.10.1145/3173574.3173593Links: Video Preview, Slides of the Talk. Demonstrating David Meets Goliath: Combining Smartwatches with a Large Vertical Display for Visual Data Exploration. In Proceedings of the 2018 CHI Conference Extended Abstracts on Human Factors in Computing Systems.CHI '18, Montreal, QC, Canada.ACM,2018.10.1145/3170427.3186497Links: Video Preview. Hierarchical Graphs on Mobile Devices: A Lane-based Approach. In Proceedings of the CHI 2018 Workshop on Data Visualization on Mobile Devices.MobileVis ’18, Montreal, QC, Canada.2018. 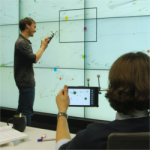 VisTiles: Coordinating and Combining Co-located Mobile Devices for Visual Data Exploration. 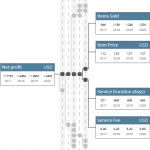 Improving Value Driver Trees to Enhance Business Data Analysis. In Poster Program of the 2017 IEEE VIS Conference.VIS '17, Phoenix, Arizona, USA.2017.